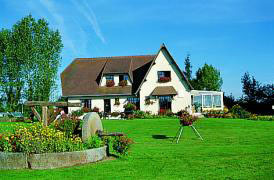 With the Historic and Artistic city of Bernay nearby, enjoy a stay for 10 people in 2 B&B. Bread baked in a wood-fired oven ! 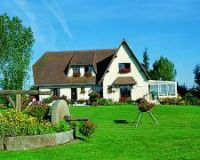 In the region of the Charentonne, Pierre and Micheline welcome you to their house. In a peaceful, green, countryside setting, spend a relaxing stay or explore the region. Normandy gastronomy at their "table d'hôtes" with homemade bread cooked in their wood oven. You can visit Pierre's "country life" museum. 2 large comfortable bedrooms. 1st floor: green bedroom (2 adjoining bedrooms with 2 beds of 140 and 1 bed of 100cm): independant access, sitting room, kitchenette, shower room and toilet. Garden level: yellow detached bedroom (5 people): 1 double bed, bathroom, toilet, kitchenette at ground level, mezzanine: 1 double bed and 1 single bed.